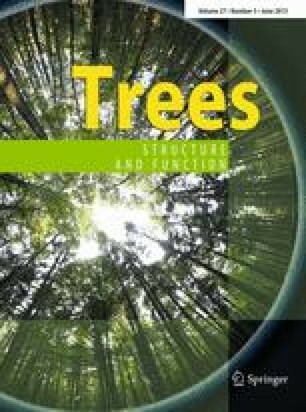 Heartwood development and other functional changes in stem conductance in response to water stress in radiata pine were investigated using two contrasting climatic areas (high-altitude sub-alpine vs. warm–dry inland) of the Hume region of New South Wales, Australia. The study included mature (34.5–36.5 years old) and young stands (10–11 years old) measured under normal climate and during an extreme drought. The effect of water stress on heartwood development was examined using sapwood percentage, sapwood saturation, development of dry sapwood and evidence of cavitation in sapwood. Trees at the warm–dry site developed heartwood at faster rates than on the high-altitude site. At breast height, the mature stands of the warm–dry site had 8–14 % less sapwood. Extensive cavitation towards the sapwood/heartwood boundary occurred in some of the mature and young stands on the warm–dry site. We postulated that in water-limiting environments, cavitation of the inner sapwood precedes heartwood formation and is an adaptation mechanism that regulates stem conductance capacity and thus water use in the tree. The drought of 2006 led to decreases in moisture associated with cavitation not previously reported for radiata pine and demonstrated the drought hardiness of the species. In the warm–dry site, breast-height sapwood saturation dropped to 58 and 82 % for suppressed and average-sized trees in a mature unthinned stand; and 75–78 % for two young stands. These saturation levels, however, only imply average values as some cells cavitated whilst others were fully saturated. Cavitation occurred in a localized fashion affecting small to large groups of cells. This was a collaborative research project between The New Zealand School of Forestry and Forests New South Wales (FNSW), Australia. Special thanks to Dr. Ross Dickson, the Hume region and the Tumut Research office. The study was undertaken during the PhD studies of the first author who gratefully acknowledges funding from Mexico’s National Council of Science and Technology (CONACYT) and Education New Zealand.